After Maria dropped out of school the following autumn, Frost arranged a job for her at a local hardware store. She quit after two weeks. He called a few times after that but never reached her. He could have driven to la zona to see her but never did. Frost's call to her on the ride back from Peacock was his first in well over a year. Maria's mother, Candelaria, told him she didn't know where her daughter was. Maria was often in and out these days. Who said that wasn't riveting? But seriously, I have some heavy duty reading to get to page 77. Fear not. 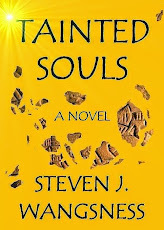 Tainted Souls is in my rotation. I'm looking forward to reading this. It's on my LONGGGGGG list of TBR books.